In 1995 Macedonio left the Ashaninka tribe, an Amazonian tribe, to pastor a small jungle church with a mixed membership of Yaneshas, Ashaninkas and mestizos (mixed race). He visits frequently the Ashaninka tribe in order to train pastors and missionaries among them. He is also working with Segadores part time, helping in the search of unreached tribes, for which he has a special burden. Within this goal, he has been asked to look for and to train a native missionary couple, willing to go to those unreached tribes. He is also teaching other pastors in his town how to use the inductive Bible study method in their ministry. The work that Macedonio and Nita are involved with is community based, they, along with their fellow Segadores missionaries, have been working on setting up drinkable water for some of the communities they live in, they have also been running medical care missions in the form of dental clinics with the donated services of Christian dentists from within Peru. The aim of these kind of services is to break down barriers between the jungle tribes and outsiders, this way the long term goal will be to preach the Gospel and to plant churches. They are well on the way in some communities but only just starting in others. There are a number of jungle tribes that have only had recent exposure to people from outside of their tribe and there are still tribes that have not had any outside contact at all! Segadores want to reach all of these ethnic groups with the Gospel. Macedonio was already doing all this before Bright Hope World became involved. He had been periodically visiting the tribal villages with Oscar Tello (another missionary Bright Hope is supporting), learning the language and showing God's love through their words and actions. Bright Hope has now helped him financially for a number of years thereby relieving financial pressures and enabling him to be more actively involved in outreach work. Directly this project financially supports Macedonio but indirectly the unreached tribal groups of Amazonian Peru are also beneficiaries. 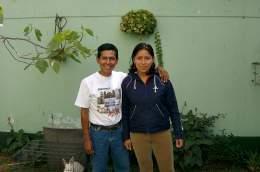 Macedonio has a real desire for people to hear the gospel and respond and also to be built up in their Christian walk. He has been involved in this work for many years and is very effective in the work he is involved with. By partnering with Macedonio the financial needs of being in the Lord’s work are lessened and it is easier for him to travel to the various villages. Macedonio was born in 1969 and at the age of 16 received Christ as his personal Saviour. At the age of 20 the Lord called him to a preaching ministry. He has worked for many years with jungle groups and is regarded as an “expert” among the Segadores group on tribal outreach. In 2006 he married Nita. After their marriage they were traveling on a bus from the jungle with around 20 other people when their bus was held up by armed robbers who took all the possessions that everyone had, including all of the wedding presents and the wedding photos that Macedonio and Nita had! The police have since shot dead one of the robbers but the rest got away. This kind of danger is an everyday occurrence in the Amazon area. The Segadores missionary team Macedonio is part of is involved along with Macedonio in the evangelistic work. A number of these missionaries are Bright Hope partners. For as many previously unreached people as possible to have the opportunity to hear the gospel in the jungle regions of Peru and that lives will to be changed with God’s love and the gospel. In June 2012 Macedonio and Nita made the decision to discontinue working with Segadores for a time. This was a difficult decision for them to make but a result of various circumstances. Bright Hope World has therefore currently ceased its financial support of Maceonio and Nita.